China will remain the world’s largest market for annual solar installations in 2015. This year the country will have added more than 17.6GW, which is an increase of around 7GW compared to last year, according to research and consulting firm GlobalData. It also states China will have the single largest share of the global market, which is expected to be close to 43.8GW by the end the year. Ankit Mathur, GlobalData’s Practice Head for Power said China’s cumulative installed PV capacity reached just under 28.1GW by the end of 2014, of which 10.6GW was installed that year. 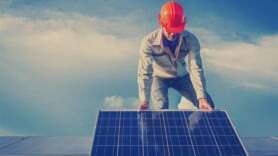 He added: “For 2015, the country had previously set a target of making 15GW of solar PV additions, comprising 7GW of distributed generation and 8GW of ground-mounted capacity. “However, China has revised its annual target to 17.8GW and is well on track to achieve this goal, given that about 5GW of solar capacity was installed in Q1.